Make your birthday a memorable event! One year older, one year wiser! Of course, you should celebrate your birthday properly. Whether you are throwing your own or your son's or daughter's birthday party, we have a style that suits you. Decorate the table using unique table decorations with personalised pictures, quotes or prints – all based on your own preferences. Then decorate the bottles on the table with your own bottle labels or bottle gift tags. Play up the seating arrangement by having your guests' photos printed on glass coasters that you put out (that they get to keep!) and hanging flags with the birthday child's photo over the table. Hang a party banner over the entrance, and boom – the party has started! 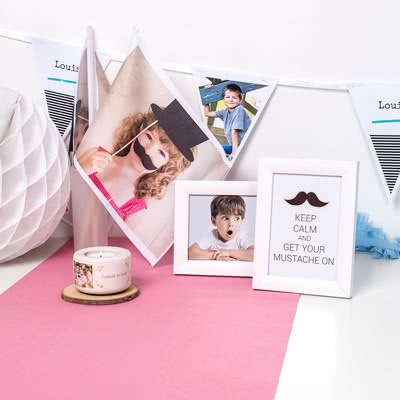 Prepare, spruce up and save the memories from the best birthday party with smartphoto! Start by sending out pretty invitations to your guests, which set the mood for the event the moment they receive the invitation in the mailbox, then proceed with ordering pretty and personalised party decorations. 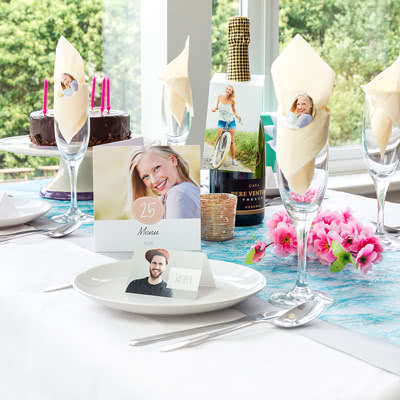 smartphoto's party decorations are extraordinary, not only are they pretty, but can also be tailored to be just as personalised and unique as you like! Make sure you make the most of the pictures taken during the party – because when it is over, you can immortalise the greatest moments in, for example, a photo book or on a canvas.